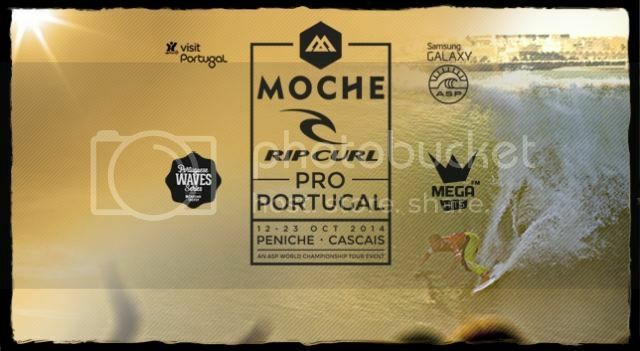 Moche Rip Curl Pro Portugal runs October 12th - 23rd at Supertubos, Peniche Portugal.Adam Melling will be there chasing valuable ratings points. The forecast looks pretty bad for the first half of the waiting period with onshores. Good luck mate. Mello surfed well in his Round 1 heat finding the tubes and laying down powerful turns. He found the highest score of the heat but missed the win by 0.1 points. He surfs next in Round 2 heat 10 vs CJ. After heaps of laydays the event finally resumed in solid conditions at Supertubos. Luck went Mello's way when CJ was forced to retire hurt , handing him a walk through. In Round 3 Adam notched the first significant score, a mid range six, for a string of cutbacks and overtook the lead on a similar righthander with 5 minutes remaining. Parko hunted the lineup but, needing a high seven, he failed to find an opportunity. Melling pulled off the upset, squashing Parkinson's Title hopes. He surfs next in heat 1 Round 4 ( No loser round ) vs Jordy and JJF. Adam found his rhythm by the midway point of his Round 4 heat. He brought some style to the tube-riding, mixing in vertical turns to earn a 9.63 and take the lead. Unfortunately JJF found a perfect 10 for a long barrel and pushed him into 2nd. Mello dusted Brett Simpson in a tough heat in Round 5 moving into the Quarters. "That was a scrappy heat for both of us. I was out of synch with it a little bit." In the Quarters Adam was first out of the gate and stayed active, tallying a 6.33 before John John Florence rode a single wave. When Florence finally did find a wave, he went big, pulling into a substantial barrel and plowing through the foam to score an 8.00. His next barrel was bigger, and he threaded section after section to make a clean exit and earn a 9.83. Mello found a nice barrel towards the end of the heat but it was not enough to overtake John. He finished the event in 5th and moved to 25th on the WCT rankings. Congratulations mate.